With the influx of plugin manufacturers coming in the pro audio world daily, you would think that the wheel couldn’t be reinvented; that every bell or whistle you could imagine has already been placed on an EQ or Dynamics plugin. Well, the folks at HOFA seem to have run across a few more hidden gems, and they’ve brought them out to the world in the newest version of their versatile dynamic EQ plugin called IQ-EQ. Upon doing some research into this company, I quickly found out HOFA is not your normal plugin manufacturer. Although they’re not as well known in America as they are in Germany, they extend way beyond the normal software development and go deeper than most pro audio companies out there do. HOFA does it all and has been around since 1988. This company has one of Germany’s largest studios, a College to learn the ins and outs of recording, graphic design house, a company that manufactures acoustic treatment solutions for studios, as well as a software development company. That covers just about every aspect of the music business you can think of. The crazier part is that HOFA has only been releasing plugins since 2010. Obviously since they have their hand in so many areas of pro audio, this gives them an immediate advantage when developing a product. But did they take full advantage of this? 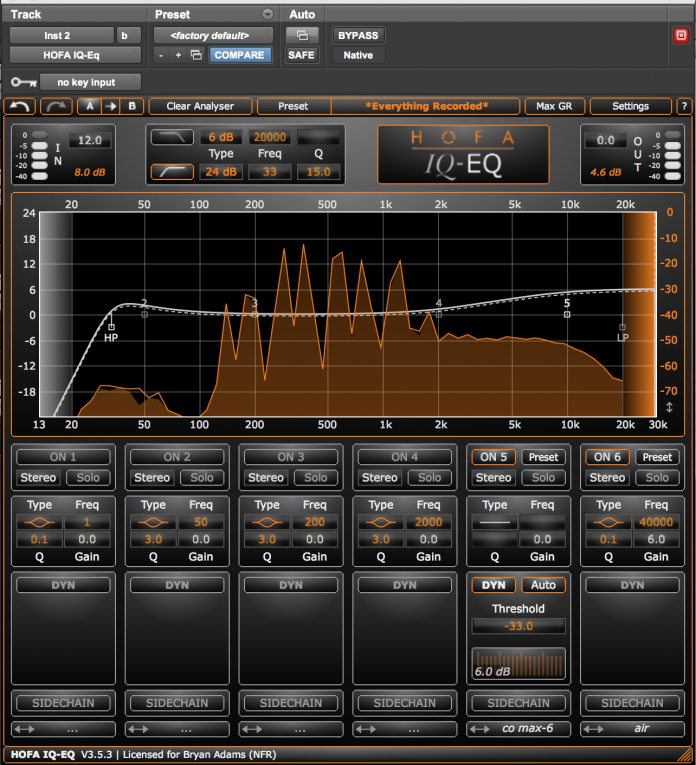 IQ-EQ is more than just an EQ plugin. It is a very straight-forward EQ that separates the audio signal into frequency bands and lets you deal with the dynamics of each frequency individually in a great deal of ways, going way beyond your normal EQ parameters of most plugins. HOFA has acknowledged that not all audio is the same, so why confine a plugin to a certain set of boundaries? The IQ-EQ removes all of the boundaries and even gives you more options that you may have not even knew existed. 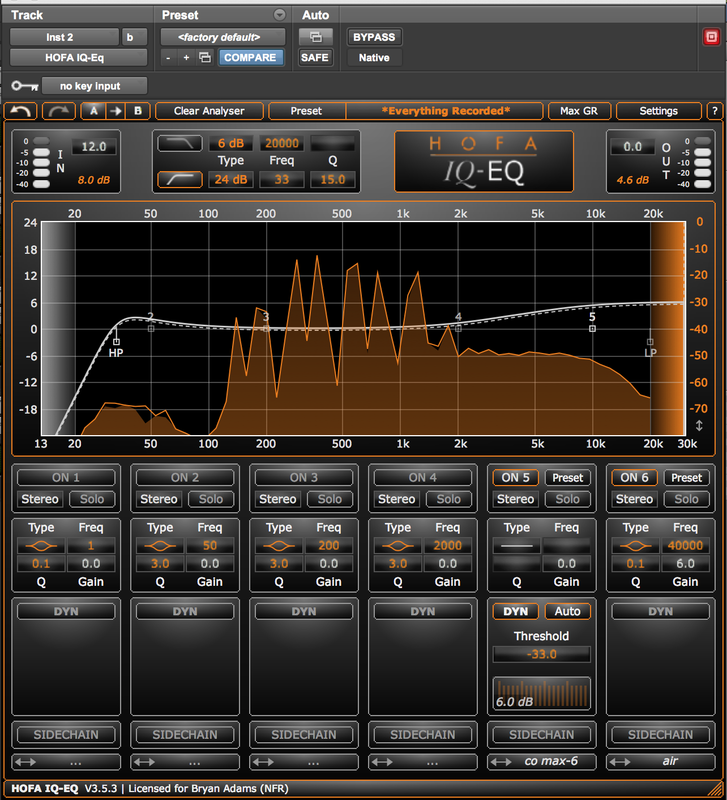 Q-EQ is available as AAX32 & 64, VST, VST3, AU, and RTAS plugin. That pretty much covers all of the bases for most DAWs. You also get 2 authorizations, making it a cinch to take from your desktop to your laptop. It offers up to 32x oversampling, 8 different types of filters across 6 bands, separate high pass and low pass filters, compression, expansion, de-essing, frequency analyzer, mid-side processing, side-chaining per band, as well as a fully functioning channel strip. That’s an astounding amount of control, but that’s not all this plugin does. We will get into that more later on. You would surmise that having all of these features would leave you with an interface cluttered with buttons but HOFA have consolidated each section wonderfully, offering drop down boxes for options not currently in use and menu bars tucked away into each function. It’s almost like an operating system in itself. The window size can be adjusted to taste which helps tremendously when you’re taking full advantage of all of the uses this plugin gives you. IQ-EQ is a complete command station, giving you both numeric and metered representations of dynamics and levels as well as a large window incorporating technology from their frequency analyzing plugin called IQ-Analyser. Inversely, if you feel the plugin is taking up too much space or you find yourself depending too much on the graphics of what you are doing, you can select “ears only” mode that collapses the EQ’s graphic display and lets your eyes take a break from making decisions. The graphic section as well as each band’s control is linked visually, making it very easy to find which band is being toggled from either section at a glance. If a band is selected in the graphic portion, the resulting controls below will pulse with a warm orange glow, directing you to its extended options. Speaking of extended controls, your frequency selection goes from 1Hz all the way to 40kHz, surpassing beyond the audible spectrum. This is handy to those who subscribe to the theory that just because we can’t necessarily hear the extended frequency, it doesn’t mean that it won’t affect the content in some way. Since this plugin has so many features, let’s break these down by section. If you want a simple EQ, you got it. IQ-EQ offers 6 bands of EQ with separate High Pass and Low Pass filters that come complete with up to a staggering 48 dB / octave Q. The Q can also accommodate a resonant shelf just above the cutoff frequency to give you that analog feel. Apart from the high pass and low pass filters, IQ-EQ gives you 6 more bands of parametric EQ that each can independently sweep the entire range from 1Hz to 40kHz. Who says you need to use the frequency bands from left to right in ascending order? Not HOFA. Just activate a band with the on switch or clicking one of the little squares in the EQ display window and you can control it in either window. The Q-Factor can go from super wide to needle thin, making boosting and carving the frequency you need mere child’s play. If you want to get even more in depth you have up to 8 different types of filters from your standard shelving filters to advanced resonant filters. The most innovative one is the “flat-band” frequency that spans the entire spectrum. This band serves a very unique purpose, which we will discuss in the dynamics section. You also get anywhere from +/- 24 dB of gain for each band. The possibilities are limitless here. With the option of stereo and mid-side mode you can also process each individual band separately in different places in the stereo field. This gives you limitless possibilities for tonal shaping. The graphic display accommodates this with different colored lines to represent each part you’re processing. It can’t get any easier. This is where HOFA starts to flex its muscles even more. Just under the controls for EQ sits the “DYN” section. One click of the DYN button and you activate your dynamics control for each band. IQ-EQ gives you the choice of letting them take care of the work by allowing the “auto” function, which in most cases works brilliantly or you can deselect auto and control it yourself. Once you go into manual mode you will see your usual ratio, threshold, attack and release options but there’s more than meets the eye in here. If you continue dragging the ratio lower than 1.2:1 you will see the orange numbers turn white. Now you’re in the negative ratio numbers, which mean you can use this as an expander or gate. Keep in mind that this is STILL separate from other bands. Pretty cool right? Another feature that’s worth mentioning needs the “oversampling” option on. Once you have oversampling on, you can select the attack to look ahead by dragging it below 0.1. This gives you a more responsive compression or expansion. The great part about the display below is that is gives you a meter to show gain reduction as well as a number telling you what your maximum gain reduction has been. Remember how I was discussing the filter option called “flat-band?” This is where this option comes in handy. If you select the flat-band filter on a band, you have turned the dynamics section into a compressor that reaches the entire spectrum… ergo you now have a standard compressor you can place in any particular slot depending on how you want the compression to react. In essence you have more than just your standard channel strip most plugins offer because you can control the dynamics based on whatever order you place it. For instance, you can place it early in the chain by leaving it in the first slot, which would compress everything pre EQ, and if you place it at the end, it would compress everything post EQ. You can also place it anywhere in between and try it out in different spots by simply grabbing the bottom arrows under the side-chain and dragging it. One of the other great things is you can compress the signal in stages with multiple flat bands without having to instantiate multiple plugins. After all of this control on each band, you’d think that there isn’t much more you would need right? Well not so fast. Directly under the DYN section is a SIDECHAIN section. So now you may be wondering, “If I have a dynamics section for each band, how will having a side-chain work?” Well it’s actually very simple. Once you activate the side-chain function, you can pick separate frequency ranges to “trigger” just how the compressor handles the signal. You’re given your 7 normal filters to choose from, a Q from 0.1 to 36, or if you’d like to trigger it with external content, you can key the side-chain with an external signal. This opens up limitless ways to process the dynamics of your frequency content. After all of these really intuitive features, you would have to think there isn’t anything more you would need. Well, HOFA has a few more tricks up their sleeve. Say you want to control the maximum amount of gain reduction per each band. Simple, if you look across the top you will see a MAX GR button. Clicking this will individually set the maximum amount of gain reduction per band. This can keep you from “overcooking you signal” if you will. Here’s another one that was an instant “why hasn’t anyone thought of this” feature. Each individual band has a preset menu where you can instantly add whatever processing you want with a click of a mouse. There are still your overall presets, but this takes it to a whole new level by allowing you to mix and match different aspects to create exactly what you need lightning fast. HOFA has even made just about any type of preset you can think of, AND they’re clearly named. This last one is a small one but extremely useful. At the bottom underneath the side-chain, you can write notes or descriptions of what each band does for easy reference. Seeing as you can process frequencies on any band, this makes finding what you’ve done a great deal easier. On top of all of this, IQ-EQ has it’s own “settings” folder that allows you to tinker with your visuals of your frequency analyzer as well as toggling features like turning on and off “tooltips” that guide you on features by hovering over a control in the window. So there you have it. Enough features to make your head spin, but is it too many? If HOFA didn’t masterfully design the flow of this plugin, I’d say yes, but everything is so meticulously placed with so much care, that it almost feels second hand. This plugin can go from as simple as possible to the most advanced plugin you own in no time flat without hogging DSP or even screen space. Having an analyzer really gives you a great overall picture and allows you to make surgical adjustments to the signal. One thing I would like to see is different types of visuals of the analyzer. Sometimes I wish the views were less jagged and a little more rounded. One other visual is the overall presets. I wish the actual box that the preset name sets in would work as a drop down menu for the presets. It’s more of an aesthetic than anything and doesn’t affect use or function. The authorization and install is all built into one program, making it easy to get right to making music. The individual presets are especially useful and make de-essing a breeze. I also like how if you go into the “extended frequency” range, the sides light up orange. It’s a good visual to show you’re using it. The resonant filter curves can also give the plugin analog characteristics and make this plugin completely able to emulate classic EQs behavior. I could go on for days about this plugin. There’s just so much this single plugin can do. Apart from needing reverbs (which they make and I will write a review for soon) and delays (maybe we can convince them to make an IQ-delay) you could mix and master entire projects with this single plugin and want for nothing. The EQ is very transparent when you want it to be and can even evoke some of the character that popular console EQs have if you know their frequency curves. IQ-EQ does it all. Since getting IQ-EQ, I’ve pretty much used it on every track that needs any frequency processing, both cleaning up frequency content on tracks as well as adding a little extra. I hate overhyping anything but this is the most versatile EQ plugin I’ve used in a very long time. It seems a lot of big companies do a few of these functions very well but have never excelled at all of these. HOFA has done this and even pushed the envelope farther. This is Everything Recording’s new “desert island” EQ and Dynamics plugin. If you don’t believe me, HOFA offers a 14-day trial period and then report back and tell me I’m wrong. I bet you won’t.